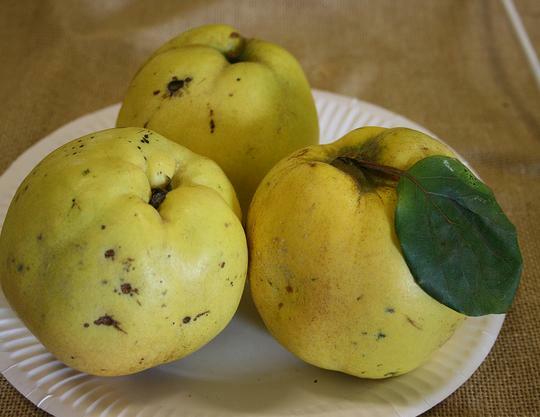 Last week the grocery store carried fresh quince, so I bought one. I had no idea what to do with a quince, so my first move was to ask the 8 Broads. The primary two responses were to use quince for jelly or applesauce. Last night I experimented, and today a fresh batch of Quince Apple Chutney was served atop Whole Wheat Pancakes. Plates licked clean. This dish is perfect as a winter fruit appetizer or side dish, too. Put all ingredients in a small heavy saucepan, and cook over low heat. Stir occasional, and cook until the apples become slightly translucent. Remove from heat. Serve warm or chilled.